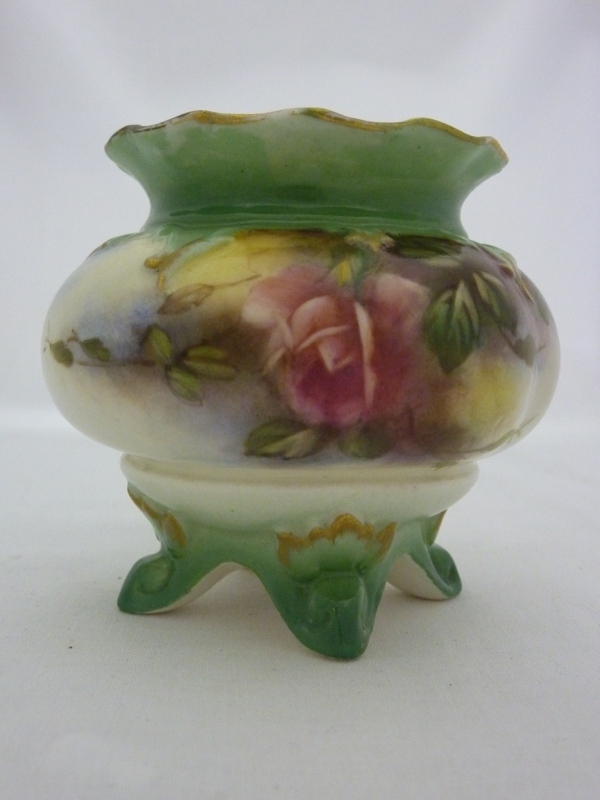 A beautiful vintage footed vase by Royal Worcester hand-painted in the Hadley Roses style.� It has the green "Hadley's, Worchester, England" backstamp that was used between 1902 and 1905. It is hand-painted with pink and yellow roses in the Hadley style on a cream glazed ground with a lime green edging near the rim and on the four feet, together with a heavily gilt gold trim.� The fine bone porcelain is indeed very fine. It is in excellent condition, having no repairs, chips, cracks or stains, and has no�crazing�which is unusual for a piece of this age.� The gold gilding shows minor signs of wear.� This vase displays brilliantly.